France’s military received an initial C-130J Super Hercules airlifter from Lockheed Martin in December. The C-130J-30 aircraft that arrived at Orleans Air Base in France is the first of four Lockheed-built planes ordered by the French directorate general of armament through a contract with the U.S. government, the French ministry of the armed forces said Dec. 22. The ministry expects the second Super Hercules to arrive this year and two units of the KC-130J tanker variant sometime in 2019. 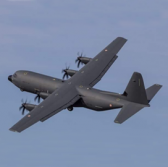 France ordered the aircraft to expand its air force’s mid-segment tactical transport fleet currently composed of C-160 Transall and C-130H Hercules platforms. Lockheed is building the French C-130J planes as part of a $650 million foreign military sales transaction approved by the State Department in November 2015. France’s DGA approved the aircraft order under the FMS contract on Jan. 29, 2016 that also includes systems support, personnel training and initial operational condition maintenance services. Lockheed received military type certification for C-130J from France’s DGA prior to delivery.